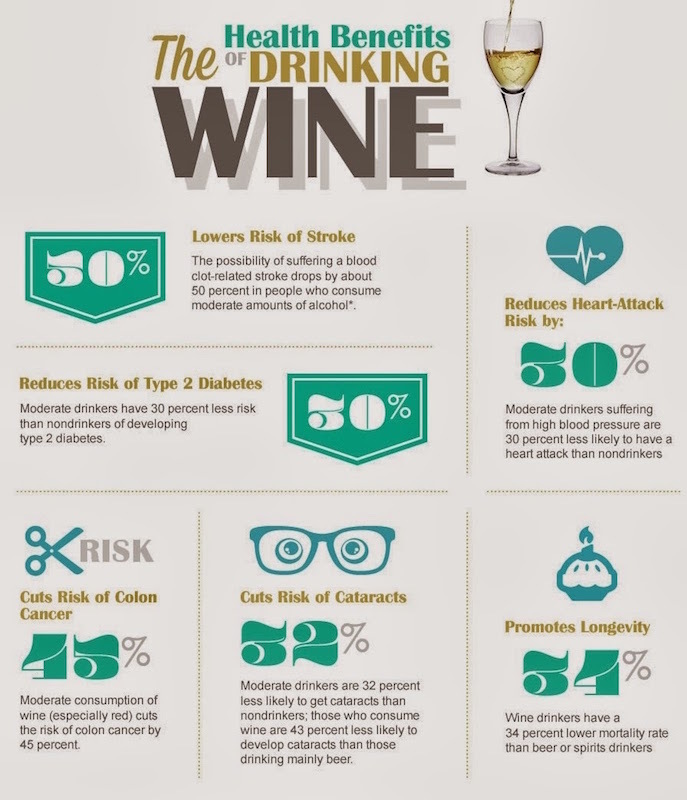 It seems you can hardly turn on the television now a days without the news telling you about another study confirming that wine, especially red wine has health benefits. Just to be confusing the occasional contradictory study also gets published. Before I go any further please understand that I am not advocating drinking if you do not already, and that I am not offering any advice, just well formed opinions. Please check with your medical practitioner for the final word on wine or anything to do with your health. Ever since 60 Minutes did a report on the so called “French Paradox” back in the early 90s, a great deal of study has gone into why a diet so heavily based on fats and alcohol consumption should not have greater statistical instances of heart disease. Many studies find that there is something about red wine that helps to reduce the negative aspects of many diets. Just what that substance is remains open to debate. The leading theory is that it is something in wine related to tannins called flavanoids. Another leading theory is that it is the alcohol, rather than red wine itself that is responsible, and if accurate that would indicate that any source of alcohol, in moderation, would have equal health benefits. The substances resveratrol and quercetin also found in red wine, may be responsible for the increase in immune systems and suppression of cancer in some patients, in some studies. This is far from a cure for cancer and a great deal more study needs to be done. Much has been made about the potential of resveratrol, but the amounts that would be required for health are far beyond the amounts found in wine. I Don’t Drink Now, Should I Start? No. If you don’t already drink don’t think about starting for your health unless directed by a physician. All of the studies agree that the greatest chance for health benefit is among those who drink no more than two glasses a day of red wine for men, and 1 for women. Excessive consumption which means more than one drink an hour on a full stomach can lead to the short term condition known as a hangover and potential long term damage to your body. Sulfur dioxide is added to wine to help control microbiological activity. Without it wine is often unpleasant, tasting strongly of fresh baked bread or yeast. A certain amount of sulfites are also naturally present, as they are in most fruits. To be fair it is Free Sulfites, rather than sulfites in general, that bother a very tiny portion of the population. Free sulfites are very low in wine. In fact orange juice, salad bars and dried fruits each may contain many more parts per million of sulfites than wine does. Sulfite sensitivity is very rare, if you think you suffer from this, contact your doctor. Warning labels about sulfites on wine are at least in a great part more about politics than health. It seems there are those who would make wine illegal again. These Neoprohibitionists work in subtle ways, prefering to chip away at public opinion, and create panic. The warning labels on wine is one of their tools. It is good to warn those who may have a problem with sulfites, but it seems unfair to scare the general population for something that is very rare. In Europe headaches are usually attributed to white wines, so in some instances the problem may be cultural, and more linked to drinking habits than the type of wine consumed. None the less, recent research has identified compounds in some red wines that may be responsible and are working on improving vinification techniques to reduce the risk of red wine headaches. Perhaps in the not to distant future those who suffer from this unpleasant malady will have the opportunity to enjoy their favorite wines again. In the mean time if red wine gives you headaches try white, or sparkling wines. Some people even find relief by switching to lighter red wine styles such as Pinot Noir. No one wants to put their unborn child at risk, but recent studies, and legions of doctors outside of the US have found that a small amount of wine can be beneficial. The theory that is most often held up is that a relaxed mother is good for the baby. As with everything on this page, please do not change any of your drinking habits without consulting your physician. A few years ago I was diagnosed with diabetes. For a food and wine lover this was the last thing I ever wanted to hear. I was sure my life was about to change, and that I would never have a decent meal or any fun, ever. My life did change, but I still get to eat pretty well. What follows is an anecdotal tale of my personal experiences. I can not begin to stress enough that I am not giving advice, and that you should check with your doctor and nutritionist before changing your diet in any way. That said, here is what life is like for a diabetic chef with a serious love for wine. Carbs are the killer. White bread and white rice are just as bad as sugar for my glycemic index (a term I will be using a lot, and abbreviating as GI). Whole wheat bread is better than white bread, but brown rice doesn’t seem to make any difference, for me. It is that “difference for me” part that is important. Being a good scientist I test my blood sugar level any time I add something new to my diet. This is the only way I can tell what makes a difference, and how much. Not all carbs effect me the same way. I can eat potatoes without a blip in my GI. I can eat starchy vegetables like beans and corn, and again, no problem for me. I so much as look at regular pasta and my numbers go through the roof (the high fiber types of pasta are much better on my numbers). The good news for red wine lovers is that most dry red wines have little to no sugar (that being the meaning of dry). White wines are much more likely to have some sugar. Personally, I love dessert wines, and these have been relegated to the once in a great while category. That said, I recently tested my numbers two hours after having a big glass of very sweet dessert wine, and I was only 110. I suspect that my body deals with the fructose (the sugar in fruit, and so wine) better than other kinds of carbs. Diabetics are trying to ensure their future. Rarely do we really have to worry about day to day effects of diabetes (unless you go way too low, or way too high). It is all about reducing the risk of complications, especially cardiac complications, that might pop up years from now. Considering the health benefits of red wine, many diabetics, myself included, consider that a moderate amount of red wine is down right good for us. Most of the expert sources reluctantly agree. If you test, and red wine does not seem to be effecting your GI, than a glass or two with a meal may be for you. There have even been studies that suggests that red wine may actually be good for diabetics. The Resveratrol found in red wine has been given credit for red wine’s effect on improved cardiac health and reduced cholesterol levels. Now it has been found to curb insulin resistance in mice. Of course much more study needs to be done, but this certainly doesn’t hurt the rationalization for diabetics enjoying a little red wine in moderation. This is important news for wine loving diabetics. Too many of us assume that our lives have been changed so dramatically that we will never be able to enjoy anything we love, ever again. In all things moderation, and for diabetics, or anyone, a moderate amount of wine may not be anything to be concerned with. I can not stress enough how important it is to test regularly, and randomly. I was so good about testing that I had gotten to the point where I knew exactly what effect every type of food would have on me. And so I got out of the habit. Dramatic, and unhealthy weight loss after a bout of the flu sent me back to my meter to see if there was a connection, and indeed there was. My numbers were in the high 300s, close to needing to be hospitalized. A couple of weeks of careful diet, and a slight adjustment of my medication and I was back to where I was before (with an A1c around 6). The great news is that I was not only able to get it all back under control again, but I did it, and continue to do it without suffering a bit. If you or a loved one are a diabetic and a wine drinker, there is hope. After checking with your doctor, nutritionists, and making sure you attorneys don’t hold me liable, you may be able to continue enjoying your red wine (and occasional sweet or white wines) without a qualm.